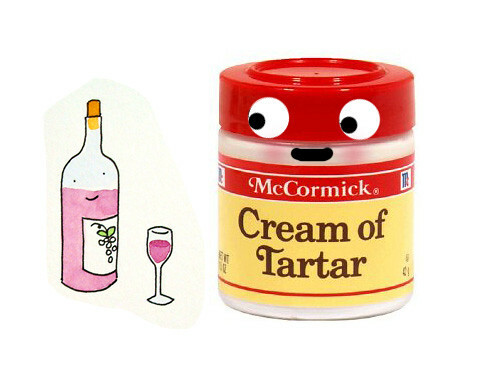 What is Cream of Tartar and What Does it Do? You've probably seen Cream of Tartar in recipes, or at least have seen it in the spice aisle in the grocery store. Perhaps you've even used it in a recipe--it's a common ingredient for meringues or meringue toppings. But what exactly is the stuff? For those of you who have ever wondered...let's take a moment to consider the life, times, and purpose of this unique white powder. What it is: a fine, white, odorless powder. Were I to see it on the counter and not have the benefit of seeing its packaging, I might confuse it with baking powder. Why the name? The chemical name for this substance is potassium bitartrate, or potassium hydrogen tartrate. As you might surmise, the "tartrate" part can explain where the "tartar" came from. I wasn't able to find a good explanation of where the "cream of" came into play, but I should clear up any confusion regarding Tartar Sauce. That name is derived from tartare, which is a dish for which this sauce a condiment of choice. Though tartar sauce is creamy, it has nothing to do with cream of tartar. Got it? Good. Where it comes from: Believe it or not...it is a by-product of wine production! I'm totally not kidding. It is formed from the sediment left over in barrels after the winemaking process; once formed, it is scraped off of the sides of the barrels and then cleaned and ground to form cream of tartar. Interesting factoid: it's said that cream of tartar residue has been found in pottery dating back 7,000 years! Food uses: Arguably the most famous use for cream of tartar (or at least the one I've seen and used it for most frequently) is to stabilize egg whites when making meringues or meringue toppings. 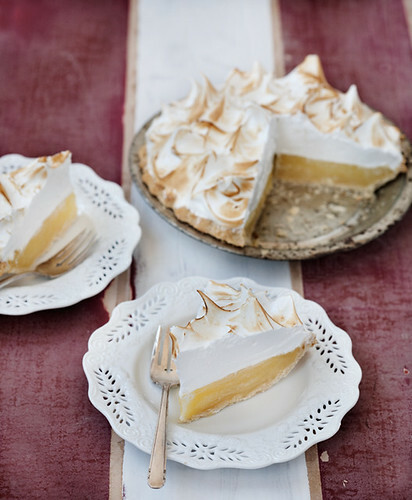 The cream of tartar not only stabilizes the egg whites and allows them to maintain their texture when whipped into stiff peaks, but it also increases their tolerance to heat, which is very helpful, say, when you put a meringue topped pie or a baked alaska into a hot oven. This allows them to brown nicely, hold their shape, and to not melt away and expose the delicious interior of these desserts! However, there are other food uses for cream of tartar, including stabilizing whipped cream, preventing discoloration of vegetables which have been boiled, and preventing sugar syrups from crystallizing (I have never used it for this purpose but am intrigued!). It can also be used as an ingredient which will help activate baking soda (hence you may see it in some cake recipes), and it also sometimes is listed as an ingredient in salt substitutes. Other uses: Cream of tartar can also be used, if you're a hippie, as a homemade cleaner. Mix it with something acidic like lemon juice or white vinegar to form a paste; this can be used to clean metals and porcelain. It can also be combined with hydrogen peroxide to clean rust from metal tools, but I will be completely honest and tell you that I find this boring. When you beat egg whites, proteins in the whites unfold from their natural shape and become tangled with each other. At the same time, you are beating air into the whites, forming small bubbles. The protein molecules become attached to each other through chemical and electrical bonds that reinforce the skin of the air bubbles. Over time, these bonds can pull the proteins closer together, forcing out the water trapped in the surface of the bubbles. Eventually, the proteins pull themselves together so strongly that compact, grainy protein lumps form and the liquid pools in the bottom of the bowl. This is where the cream of tartar comes in. It helps prevent the formation of chemical bonds between protein molecules. When you whisk egg whites in a copper bowl, some copper ions migrate from the bowl into the egg whites. The copper ions form a yellow complex with one of the proteins in eggs, conalbumin. The conalbumin-copper complex is more stable than the conalbumin alone, so egg whites whipped in a copper bowl are less likely to denature (unfold). 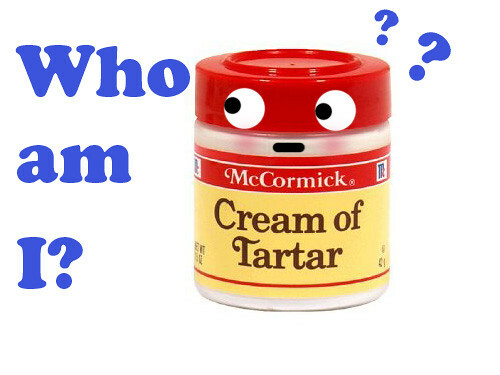 Who know Cream of Tartar was so OLD, interesting, and useful? Not me. 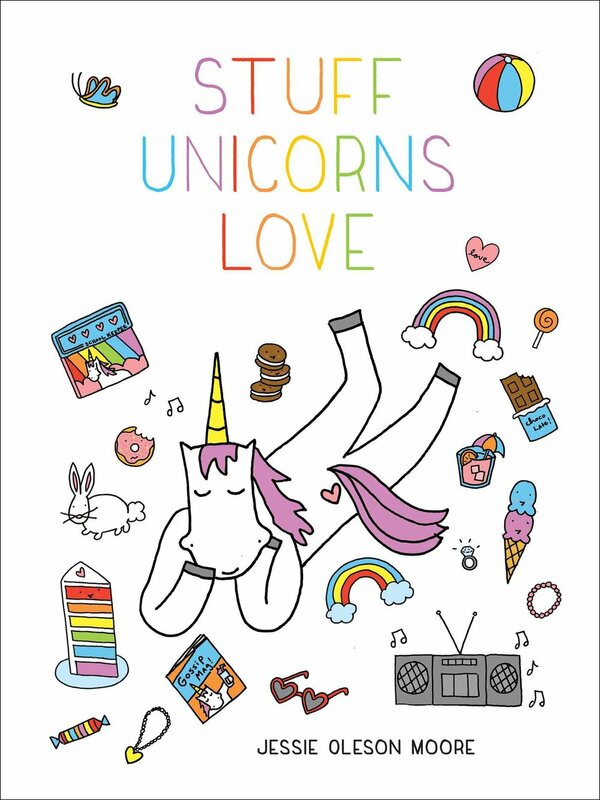 Cue the "the more you know" music, fade out with a rainbow, and enjoy your newfound knowledge, sweeties!